It all began a few years ago when I stopped by to see a client around Christmas time. A holiday gift was delivered from a vendor and my client asked the receptionist to put it in the conference room with all of the other presents. Out of (professional) curiosity I stuck my head in the conference room and was astonished to see a long table laden with dozens of bottles of wine, food stuffs, chocolates and poinsettias. My client shared with me that any of the staff could go in and take anything they wanted, they didn’t even really have time to appreciate the gifts because the season was so hectic. Send a “we value you as a client” gift the week of Thanksgiving. We’ll time it to arrive right before the holiday. Your client will receive this wonderful surprise gift at a time they didn’t expect it. You may get a call or email from them that very day. They utilize your gift over the long holiday weekend. 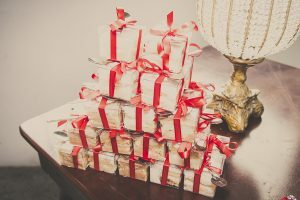 Our beautiful gifts have been the featured centerpiece in kitchens, the hors d’oeuvres before the big meal (or during the game) or even the tasty dessert accompaniment afterwards. Because your gift is featured as part of the big day, your client has a chance to brag about you to friends and family who are gathered together. Sometimes, those folks even need your services and they know two things about you now—you do good work and you value your clients. Expect to hear from some of those clients and their friends and family in the next week or two. Because the holiday hustle hasn’t started yet, they have time to thank you and even send some referrals your way. There you have it! My Secret Weapon is bending time to work in your favor. The holiday you choose, doesn’t have to be Thanksgiving, it can easily be Easter, 4th of July, Memorial Day or any other holiday where people gather to celebrate—even late January can be an excellent time to send the right gift, a gift that will be appreciated and talked about throughout the year. Give me a call today to make your reservation for this Thanksgiving’s Top Secret gift-giving operation. We’ll work with you to send exactly the right gift—one that fits your company image and budget. With this strategy, not only will you have the perfect gift, your gift will own the conference room table!